Performing a car diagnostics check can reveal a number of problems associated with the Engine Management system, Transmission system, Airbag, Body control system and even the Tyre pressure control system along with many other systems on your vehicle. So after a quick "Plug in" we can identify how to tackle the repair to your vehicle and advise you upfront of the costs involved. The diagnostic analysis can tell you a lot about the vehicle: combustion engine build up, general timing issues, performance of the fuel injector system, firing status of the ignition coils, engine revs, air and liquid temperature, the position of the camshaft / crankshaft and the throttle settings. Once the car diagnostic has been performed, the computer will tag each data point to reveal what needs to be corrected and stores this code so that the technician can look in a specific area for the problem. Car diagnostic scanning tools will save the garage a lot of time searching for the problem and will inevitably save the car owner money by effectively reducing the labour costs of identifying the damage. When the engine management lights come on the dashboard, the car owner has little idea what could be causing the problem. 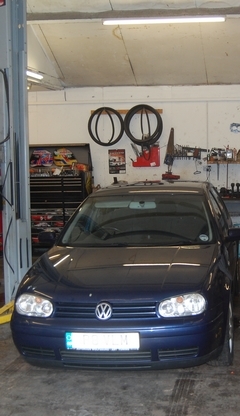 A computerised car diagnostic check can highlight the problem so that the mechanic can fix only what needs to be fixed. It takes less than an hour to perform most car diagnostic checks. Most car diagnostic checks can be performed in under an hour. Here at De Lisle we are proud to have a full range of state of the art vehicle Diagnostic equipment covering 99% of vehicles. We can also diagnose Air Bag and ABS faults.